On the way from Ljubljana we stop on the edge of a 300 metre high karst rock to visit Socerb Castle offering breathtaking views of the Slovenian coast. Due to its location, Socerb Castle was already an important stronghold in Illyrian times;it was modified into a fortress in the Roman period. On the coast we first walk through Piran, a well-known seaside fishing village with a rich history that is heavily intertwined with the history of the Venetian Republic. We continue towards Portoroz, the centre of Slovenian tourism on the coast. In the summer we recommend a visit to the Soline Nature Park, one of the most important cultural sites in Slovenia, where traditional methods of salt production are still used.The salt-rich soil of these wetlands provides ideal living conditions for a variety of plants and animals. 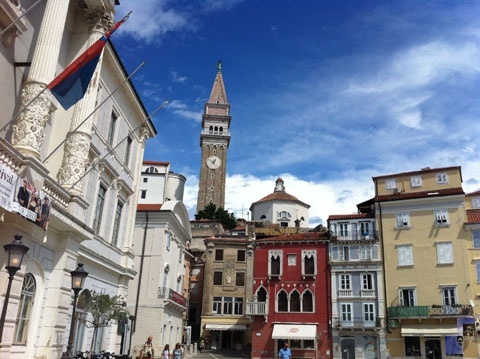 We also visit medieval Koper with its well-preserved Venetian architecture. After lunch, we move along the panoramic path with a picturesque view over the coast towards Hrastovlje, known for its Romanesque church of the Holy Trinity, listed on the World Heritage List. The church is known for its frescoes from the 15th century - the most remarkable among them is the Danse Macabre that illustrates the powerlessness of both poor and rich before Death. If there is enough time, on our way back we stop in the picturesque karst valley Rakov Škocjan, a first-class marvel of nature. On a short walk we explore the beautiful Rak gorge with its two natural bridges created by water. *Price includes: transport and guidance in English, Russian language. Optional supplements: entrance to Soline Nature Park (8,5 €/ person), entrance to Romanesque church of the Holy Trinity in Hrastovlje (3 €/ person).